At Enterprise we recognise the key that after sales is to client retention. With this in mind we have a very open and flexible service for spares and service. We recognise that “when a customer phones for a spare part it can mean it is about to fail” and therefore it takes priority over other activities. Manuals are always supplied in either duplicate or triplicate with electronic medium back up. Our UK office keeps copies of all the manufacturers manuals for ease of ordering and to ensure accuracy. Usually the manuals include a section giving the data sheets of the commercially available parts to allow them to be purchased locally. The part can be taken from our store and sent via a commercial courier service or hand carried by one of our employees to site. Alternatively the spare can be sourced locally by the customer with our assistance. This “open” policy means that we will provide the original suppliers part number and the technical data sheet for the part if it is a proprietary part. If the part is a fabricated item we can email the original machining drawing of the part to allow you to manufacture on site or at a local workshop. We are still supplying spare parts for machines originally manufactured in 1967. 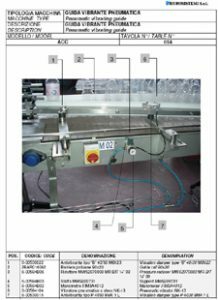 If the original manufacturer no longer exists for a machine we have supplied then we endeavour to secure the full manufacturing drawings to ensure continuity of support. Before the machine is even delivered we believe in training the customer engineer in our manufacturing works on the actual machine they will be receiving. Therefore a training course is generally included as part of the contract. Much of the equipment has modems making remote diagnostics and rectification possible so that no time is lost waiting for an engineer to arrive. In fact sometimes we fit modems with special GSM phones so that we are not reliant on the local telephone company supplying a line to us. Additionally service engineers are provided either by the original equipment manufacturer arranged by us or we use our own engineering recourses. All of the above endeavour to demonstrate how important we rate your continuing production.